We’ve been keeping a little secret at Pazzles for several months. Actually it’s a pretty big secret, and we are thrilled that we can finally share! 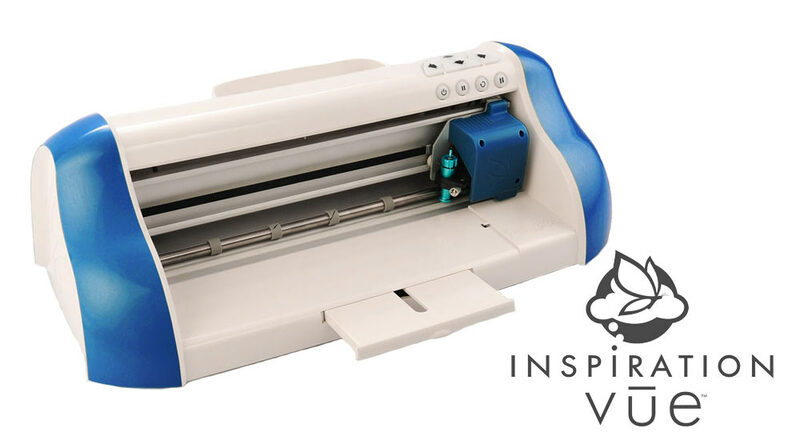 The Inspiration Vue™ will begin shipping late Spring 2014. Preorders will be available March 10, 2014. Watch for more details on pricing and pre-order specials coming soon. Be the first to know when new information is released by signing up for our Inspiration Vue™ newsletter on the left hand side. Inspiration Vue™ Pre-Order Party Giveaway Inspiration Vue™ Pre-Order Information Inspiration Vue™ FAQ Introducing the New and Improved Pazzles Inspiration Pen Tool! I am sooooo excited! Hopefully March 10th will come fast..tee hee. sooo excited….I see no submit button for the newsletter form. I finally dusted my Pazzles Inspiration off and started using it after 3+ years in the box and LOVE it. What software program will this one use and is it quieter? I also see no submit button for newsletter. However, I want!!! I can hardly contain myself!!!! Claudia if you fill in your info and hit return you will get an email to confirm your subscription to the newsletter. Did you all see that it was Mac compatible? That’s fabulous! Awesome..I love my puzzle..please say you will give credit towards new machine if we turn in our old one.. Can’t justify 2 machines..but I like the sounds of this one..have personal had 11 friends and a daughter by the pazzle. I have been looking at getting a new pazzle in March. Surprised to see this. Hope it is something I can afford. Will it be available with the subscription deal? Hope so! Does any one know price? You all know I’m wishing for purple! I’m hitting the subscribe button but it’s not doing anything..
rtdarke, Wait a couple of minutes then check your email. You should get a conformation. The same thing happened to me. I would like to know if I can trade mine in too? I’ve never had it out of the box! SOOOO happy about this. I was hopping Pazzles was doing something new after the other company introduced their new machine on hsn. didn’t care much for theirs. never have. I don’t even think it has the print and cut. I will be waiting with great anticipation. wonder if it will work with an ipad. how cool would that be? I already love this machine and all of our tools are compatible makes it a win win. Now this little baby I would buy…the other one…hmmm no, thank you! This is MY submit button! I would like a trade in also. I think I might just have to move from Ireland to the good old USA so that I can get one of these babies, lol. I’m interested to hear a lot more about it and what the shipping costs would be for me. I’ve already dropped the hint to hubby that this new machine is out, his reply was “What are you trying to say”, I merely grinned and he laughed. I would love to see a demonstration of it at work. I love the idea of new improvements. But, frankly, I just can’t justify having a new one when my old one works wonderfully. I just wish an improvement kit can be added to my present PI. Unless, there is some sort of arrangement for trade-ins??? which does so, as the current machine process is a little bit difficult. Please let us trade in/up our current machines!!! Will all the accessories for the old machine work on the new machine? 3/10 won’t get here soon enough!! the print n cut feature is the only thing I envy on other machines!!! xxxmmmm thinking what I need to do to be able to afford to get the new pazzels!! sounds like a dream come true!!! Hi from the UK! Are we going to get this in UK? AND more importantly can we trade our old ones in as mine is less rah name year old?! radkom, Then new machine has Compatibility with existing Inspiration tools, mats and accessories. I love new toys ! But, I won’t be trading in my “old” one, I’ll just keep both. Thanks Pazzles, again, you’re the best ! oh Lordy, can’t wait to hear more about it especially the new print and cut! Do you think it will come in a bright RED?!? Thanks to our Pazzles Team! I’m anxious to have a Vue! So excited about the improved print and cut feature! And the mat feeding! And all the rest!!! Wow,this is really a great news. I cannot wait till the end of May when I’ll finish my school to only do craft with Pazzles!!!!!!!!!!!!! !And not Vue!!!!!!!!!! Are we going to be able to purchase the new Vue at a discounted price with a 2 yr. commitment to the Craft Room like the previous Inspiration? I hope so ’cause that’s like getting your cake and eating it too!! if they do the $99 plus 2 year membership and if we are already a member can we still get it for $99? So much information. . .. . so MANY questions. . . .sounds like the first newsletter will be jam packed. I like the rest of you need to be able to justify the cost so trade in/discount sooooo hoping for! Someone please tell me what the optical eye is for?? And Print and cut?? I have heard a great deal of chatter on this, but have not gone there yet – doesn’t the inspiration already do that? Wow – this is really great timing. I was going to give up mine for a Cameo but would much prefer to check out the Vue since it’s from your great company. Excited to find out more and I’m with the other commenters…how about a trade in? Gotta gotta gotta get it! does this mean you are letting us trade in the old Pazzles Inspiration on the new one? Or at least a nice loyalty discount?? Are we going to see you on HSN? I know some Pazzle cutting blades are sold on there. I am so geeked. Pleeeeeease share more soon. Hoping we can trade in old one for new one…have never been completely satisfied with old one in trying to resolve issues so am not too eager about reinvesting that kind of money again. By “print and cut” – does that mean it will print like a printer?? I have been reading these posts and holding my tongue long enough. I’m beginning to see red, reading the comments here about trade-ins. I don’t know where in the world you get these ideas. I think one person thought of it and posted it, then everyone else jumped on the bandwagon. I have a small business. It is a mastectomy boutique. Now. Imagine for moment, just imagine, that we were to get in a new silicone breast form that is super whipped and light as a feather. Cutting edge. Now, imagine if all our sweet little ladies came out of the woodwork and wanted to return their old breast forms for credit toward the newer models. We would be like, what the heck?? What would we be able to do with the old ones, but throw them out? How could we financially be able to give credit for old merchandise? It would be the craziest. Idea. EVER. Here’s how it works, in the real world when you own a business. Income in = budget considerations = expenses out = hopefully coming out in the black each quarter, but usually one hopes to just break even. There is no magic cushion of unlimited funds to do whacky stuff like this out of thin air. Just because one owns a business doesn’t mean they are made of money. Let me ask you. When the newest computers come out, do consumers feel it is their right to ask for credits for their old, used ones? And furthermore, if you were a business, would you want old merchandise coming into your warehouse with odors, bugs (not that you all have bugs but I’m just saying it DOES happen), and no telling what else lingering in them? What in the world do you expect Pazzles to do with your old machine? Take it apart and use it to build… WHAT? A tower to Mars? They may respond and say yes, but I just wanted to get it out there that I think there are a lot of comments floating around there that are “it’s all about ME”, and totally selfish and unfair. I’m a pretty agreeable person and don’t like to stir up conflict, and thought very hard before posting this. I’m just very surprised, that’s all. Sorry, but you are comparing apples and oranges. I have a car that is two years old. A newer modeling comes out with some “optional enhancements” but my two year old model gets me where I want to go and is in good working condition. You are going to have to give me some incentive I.e. A trade in if you want me to incur a debt for something that I don’t really need. Since you are in business for yourself, I can appreciate where you are coming from, but in this economy I think it’s unfair for you to make people think they are being totally unreasonable in looking for some kind of incentive to move up to the next model. Are we going to be able to see the Product Video Preview? ah….cant wait! Just saw the newest cricut few days ago…! Sounds Wonderful How can we get one in Australia will we be able to order one still on line? Xmas lady, isn’t it true that Pazzles has stated the new machine will be more affordable? There’s your trade-in. Or trade-up. Or incentive. Frankly, with their research and development, not to mention the costs associated with patents and other legal avenues to protect their unique features, I don’t see how they managed to lower the price. It seems like the last time I checked, the cost of new cars has gone up with every year’a new model. Oh but I forget. Apples and oranges. How exciting will it be available in South Africa? I love my pazzle and look forward to owning a new one. We need an agent in Kwa Zulu Natal South Africa. am as excited for this one as the first. sure wish I could get it now! will the new mac software work for the Inspiration?? If not, are there plans to make this possible? lesliescraps has it right………….There are a number of options for your old well loved machine, you could donate it (tax donation), sell it on ebay, give it to a friend/relative. I can see advantages of keeping the old and buying the new……. I was delighted to read about the new Pazzles Vue, I have owned a Pazzles Inspiration since 2010 and have been a member of the craft room since then as well. Can you please tell me if the proposed offers on the new Pazzles Vue will be available to Craft Room Subscribers in Britain? also can you tell me where and when I will be able to purchase the Vue?